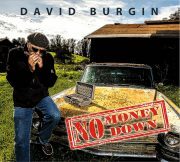 “No Money Down”, the long awaited new album from legendary harmonica player David Burgin. After 30+ years David Burgin was back at Prairie Sun Recording laying down tracks for his new album “No Money Down”. The album is coproduced by David Burgin and Allen Sudduth. In 1981 David recorded his first solo album, entitled “Wild Child” at Prairie Sun, with Allen engineering. David has also produced records for the likes of Hamblin/Fanucci, Amos Garrett, and many others, lending his keen, bluesy ear to these records. During David’s long career he toured the US and Canada, sharing the stage and recording with; Harry Chapin, Jerry Garcia, Johnny Cash, Maria Muldaur, Amos Garrett, Roy Rogers, Sammy Hagar, Colin James, k.d. lang, and many more. For “No Money Down” David has put together a fantastic group of musicians and after 30+ years is reunited with his longtime friend and legendary slide guitar player Roy Rogers. In addition to Roy, accompanying him on this on this project are; Volker Strifler on guitar. Volker is known from the Ford Blues Band and the Volker Strifler band. Danny Caron on guitar; Danny has played with Bonnie Raitt, Donald Fagan, Dr. John, Van Morrison and many others. Jim Pugh on B3 and piano; Jim has recorded with Etta James, Van Morrison (Official), Robert Cray, B.B. King and many more during his career. Kevin Hayes on drums; Kevin Hayes has been part of the Robert Cray Band for over 18 years and a D’Amico Drums artist for over 15 years. Kevin has also recorded with B.B King, Van Morrison and Old Crow Medicine Show just to name a few. On bass is Gene Houck; Gene was part of the Rogers & Burgin band and along with David Burgin, he has also recorded with Norton Buffalo and later created his own band, Gene & The Hawks. Rob Sudduth on saxophone; Rob has played with Huey Lewis and the News, Norah Jones. On horns is Marvin McFadden; Marvin has played with Huey Lewis and the News, Santana and Ray Charles. Last but not the least, David Burgin is blowing some of the finest harp that you and your mama ever heard. This new album evokes thoughts of some of the greatest Chicago and Memphis blues, with big horns, pumping B3 organ, and dirt soaked harp, and guitar. You want to hear this record!